If Hanukkah was once the dilemma of too little oil for the faithful, there is an oozing glut today, waiting to engulf the region. The past year has been, by all accounts, the most peaceful in Israel's history. Which means 2011 will probably be a doozy. Each night this holiday, recall but eight problems that are not going away, which threaten the well-being of Jews and Arabs alike, and which will make themselves known in the coming year. Bibi Netanyahu's trickery, of the sort successfully employed during the 1990s to hamstring Oslo and Bill Clinton, will prove fruitless in resolving these issues, Speaker Boehner regardless. There's no miracle in sight, short of the miracle of real leadership. Forget morality. Forget legitimacy. Forget all the arguments of entitlement and birthright and absurd renderings of that pissant Ahmedinejad as the next Führer; the usual arguments about Israel and Palestine are smoke, blotting out the fire from the sun. Israel, a nation seemingly defined by its willful ignorance of circumstance, then the bloody, forced acceptance of the same fate at the hands of "will-o'-the-wisp" adversaries, should be worried about what actually happens. Even during the festival of lights, one shouldn't play with matches. TINDERBOX 1: "Dude, Where's My Treaty-Backed And Internationally-Demanded Car?" — THE FLAWED LOGIC OF THE TWO-STATE SOLUTION AND IMPLICIT DILEMMA OF "LAND FOR PEACE"
Two states for two peoples. For decades, while leaders as late as Golda Meir could argue there are no Palestinians, as "scholars" made the bald-faced case that Israel's Arabs were late migrants from neighboring environs, this formula of peace was the redoubt of only the far-left wing. Now, even Bibi Netanyahu, dining as a child under the portrait of far-right Revisionist Zionist leader Ze'ev Jabotinsky, subscribes to the idea of some sort of Palestinian state. As the decades of occupation slouched on, and as the First Intifada increased the cost of expansionism, Israeli leaders gradually grasped the concept that some sort of sovereignty for Palestinians would lessen the load. Cut a deal with Arafat in his Tunisian exile, bring in his cronies to run their little fiefdom, and retain ultimate control over all the turf. And maybe, as conditions improve down the road, pull back and make a real peace deal — once Israel's security is guaranteed. Several waves of military pullback later, and there's your Palestinian state. There are several flaws in this thinking, but perhaps none tolled the ultimate impracticability of the two-state solution louder than settlement expansion. From the Palestinian perspective, violence in South Lebanon and Gaza forced the Israelis out; negotiations brought not one evacuated settlement, but instead a doubling of the settler population. It's simple: even putting aside the entire question of Palestinian behavior, there can be no second state if there is no land over which the Palestinians will be sovereign. Even the much-vaunted Camp David talks in 2000 only dealt with 46% of 22% of historical Palestine, owing the lack of settlement sanctions and loophole-threading by Tricky Bibi. Thus negotiations today are about something unattainable, a pockmarked lunar landscape. Gaza is not even mentioned in official channels; Hamas/Fatah reconciliation was not a prerequisite to talks, an absurd scenario that renders even the most miraculous of treaties as worthless as human rights law. It's a cruel joke to consider Abbas and Netanyahu level as partners; it's like playing poker when the shark across the table has all your chips. Borders would be the only thing worth discussing; settlements constantly skew them. Netanyahu has not abandoned the basic arithmetic: the most land with the least number of Arabs. ENDGAME: Gradual binationalism and creeping apartheid. 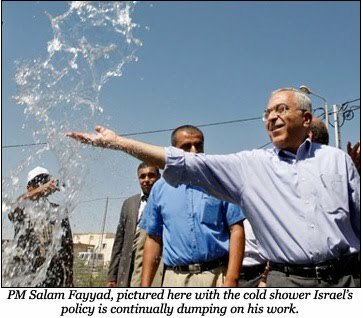 If you regularly follow Israeli-Palestinian news, you've probably seen this line in the past year: PALESTINIAN AUTHORITY PRIME MINISTER SALAAM FAYYAD IS DOING WONDERFUL THINGS. No less cretinous a scribbler than Tom Friedman popped a major Chalabi last June over Fayyad, and Israeli President Shimon Peres even had the chutzpah to compare him to David Ben Gurion (probably better for hard-core Zionists to ignore the implications of that analogy). After becoming PA prime minister in the wake of 2007's disastrous Hamas-Fatah coup, Fayyad, a former World Bank economist, has overseen a modest improvement in the Palestinian economy. And I've seen the results for myself; Bethlehem on Christmas last year was a pleasant success, and Ramallah, as is often cited, is indeed a lively, bustling city. Fayyad is not corrupt, and is not even a member of Fatah, a welcome change from the crowd of racketeers who have wielded power since the PA's creation. I like Fayyad, but his successes just make me sad, because I don't see a happy ending. As leftist politican Yossi Sarid has written, the specter of an effective Palestinian executive renders null the Israeli argument that there is no Arab partner, that the PA, as O.J. defense attorney and Likudnik mouthpiece Alan Dershowitz wailed, is engaged in "lawfare" against Israel. Netanyahu is fond of saying that Israel will "give when they get," that the only thing stopping Israel from making peace is the failure of Palestinian leaders to restrain militant groups, or stop incitement in public schools, or recognize Israel as a Jewish state. Fayyad is a problem because he renders those excuses completely implausible. Besides having cleverly stamped out anti-Israel incitement in public schools, the Fatah-dominated Palestinian security forces in the West Bank have been a partner to Israel in torturing, illegally detaining, and even killing suspected militants and Hamas sympathizers in their jurisdiction, as well as cracking down hard on anti-PA leftist protests. But this is still not good enough. The occupation remains as cruel as ever, regardless of how high apartment prices are in Ramallah. The fig leaf of PA authority is violated at the drop of a hat by IDF forces, as Israeli troops regularly enter the Palestinian-controlled Area A of the West Bank. The killing of a settler last December near Ramallah and the slaying of four more this fall was met by the PA with mass round-ups of the usual suspects, but such action did nothing to dissuade IDF forces from entering their turf to kill the perps (which, in each case, was accomplished within a couple of weeks). The much-vaunted, U.S.-trained PA Executive Force, led by notorious Gaza racketeer Muhammed Dahlan, nearly whacked Hamas Prime Minister Ismail Haniyeh, before attempting a Condi-endorsed coup against the Hamas government. And so it goes today, that many of the Palestinian spooks Israel relies upon are responsible for Hamas's violent takeover of Gaza and the collapse of Palestinian power-sharing. The Israelis get what they want at less cost: security, the dirty work done by Palestinian interlocutors who share many of the same enemies, and whose brutal tactics are one step removed from Israel. Israel will lose even that proxy once peace talks finally collapse. Fayyad is in fact perceived as a very real threat to Fatah cronies, strongmen like the gravel-voiced Jibril Rajoub who control the security agencies. Dahlan is openly feuding with both Abbas and Yasser Arafat's nephew, Nasser al-Qudwa, over succession. 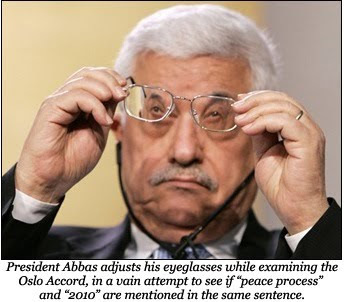 President Abbas illegally holds power, having pushed off elections and never rescheduling them; at the age of seventy-five, it seems unlikely he will wish to continue on past 2011. Imprisoned Fatah leader Marwan Barghouti is another wild card, especially if he is released in a prisoner swap for captured IDF soldier Gilad Shalit. The PA is deeply unpopular, delegitimized as agent of any effect; 2011 may be its death date, replaced instead by a factionalized polity of strongmen. ENDGAME: Loss of security benefits provided by PA to Israel, likely "reoccupation" of the remaining West Bank cantons mostly run by the PA. Possible resurgence of popularity for Fatah, especially if security services adapt into militant networks. Likely "warlordizing" of Palestinian polity inside the West Bank itself. Loss of the most conciliatory Palestinian partner in history. About a month ago, a parody rally was held mocking the idea of principled, substantive leftist politics. The rally organizers took the putative idea of a sincere left-wing mass movement, dismissed this idea as absurd, then organized one of those awful, all-white flash mobs that spreads via Twitter, five hundred people having a gay old time all ordering Blizzards at the same time at the same Dairy Queen. The speakers shadowboxed, speaking so glibly of their commitment to foreign ideals as to render the beliefs ridiculous and contemptible. Such sly mockery and silver-tongued goading was employed by craven arbiters of the status quo, feathering themselves in the adulation of their followers. It was a feel goodfest for the hip, the same laughlines we hear every night met with the same chuckles. The crowd — upwardly mobile youths for the most part, tempered by some especially hip old-timers keeping up appearances — ate it up, and left feeling contented by their own cliqueish ardor, so enchanted they were to be in on the joke, to perceive the wink. I am talking of course, of both Jon Stewart's "Rally for Sanity" and the fifteenth anniversary memorial for slain Israeli Prime Minister Yitzhak Rabin. Both rallies function better as a mockery of any real risk-taking at the behest of a conviction, its attendants and speakers coming to feel good about themselves, saying those good words. Peace! Love! Understanding! And then, as they walk back to their cars, they discard the signs and placards in overflowing trash bins. The remaining left wing in Israel is a really courageous bunch of people, religious and secular, Arab and Jewish. And they are all the more heroic considering the ongoing assault over their very presence in the marketplace, amidst the systemic collapse of the Labor Party and rightward march of Israeli public opinion. They are a cautionary example to Americans of what political vacuity wreaks: a country where the Tea Party wins. Had the youth that elected Obama turned out, the GOP would not have regained the House; were Israeli youth to realize the violence with which it will become necessary to prop up the occupation, they might give Bibi pause. ENDGAME: No left wing counterbalance means no corrective applied to Israel's self-destructive course. Continued assaults against the remaining left are growing more vicious, will continue to alienate the world; the thuggish student group Im Tirzu have become the right wing spearhead on Israeli campuses, endorsed by Education Minister Gideon Sa'ar in the fight against academic "Palestinomania." In America, it means Generation Y's narcissistic disengagement will continue unabated, no matter how horrific Afghanistan/the economy becomes. Consider it a warning. MEANWHILE, in GOTHAM CITY, life is hell. A million miles away from you there exists life as a squirming weevil, pinned inside a display case for all to see and none to unfix. Thirteen hundred Gazans killed in a thirty-day bombardment of every square inch of the Bantustan. Besieged, with a fraction of the staples of everyday life permitted in. More than any other facet of the Israeli-Palestinian conflict, Gaza is the source of the greatest number of lies preferred by all the region's execrable spokesmen, be they of Hamas, Egypt, or the Israeli Foreign Ministry. I'll be devoting a longer entry to Gaza in the near future; for now, just ask yourself: would you like to be an American living next to a Fallujah of your own design? ENDGAME: Gaza as an independent entity, detached from the West Bank and rife with radicalism. A Gaza War every few years. Who killed Rafik Hariri? It’s a question no one wants to know the answer to anymore, except Americans, the UN and the French. Rafik Hariri, "Mr. Lebanon" himself — former prime minister, restorer of Beirut, billionaire construction magnate consistently ranked high in the Forbes robber baron rundown — was whacked in 2005 near the Beirut Corniche, his motorcade decimated by a half-ton TNT speedball detonated by an unknown suicide bomber. Assassination is the cheapest form of currency in Lebanon; anybody who's anybody either was assassinated, will be, or is Walid Jumblatt. Even Hariri, a global titan very tight with both the Saudis and Jacques Chirac, was not immune. Who did it? Well, almost certainly Hezbollah, in connivance with at least some elements of the Syrian military and intelligence apparatus; whether Syrian dictator Bashar al-Assad knew about it is a legitimate mystery. Why? At the time, the Syrian Army had been occupying Lebanon for nineteen years. Hariri, once a Syrian ally in Beirut, was flirting with anti-Syrian forces, after their ham-fisted extension of puppet president Emile Lahoud's term. Hariri's last meeting with al-Assad, in the summer of 2004, left him frightened; Hariri confided to his inner circle that Bashar, the mild-mannered ophthalmologist, had threatened him in no uncertain terms to accept Lahoud. The next February, Rafik was dead along with twenty-one others, victims of a young male suicide bomber with an expansive knowledge of the Hariri motorcade's route. If the murder was intended to shore up Syria's hold over Lebanon, it backfired completely; the subsequent "Cedar Revolution" succeeded in forcing Bashar and buddies out of the country. And now, coming UN indictments against Hezbollah intelligence officials, affiliated with alleged Hezbollah phantom/Mossad rotisserie Imad Mugniyeh, have Hezzie Secretary General Hassan Nasrallah pacing his bunker. The theory goes that Syrian elements subcontracted the hit to Hezbollah, who had no great love anyway for Hariri. And a cornered Hezbollah is a scary Hezbollah. Even the current prime minister and scion Saad Hariri is so spooked, he's toeing the Syrian/Hezbollah line — even though they almost certainly whacked his father. All this would be the usual Mideast cocktail-hour speculation, were it not for one Captain Wissam Eid of the Lebanese Internal Security Forces. Captain Eid had the unfortunate distinction of being a noble person and the unseemly hobby of trying to determine who killed Rafik Hariri. As the UN investigatory team careened from one dead end to another, Eid identified the one fingerprint left behind by Hariri's assassins: their communications. Eid isolated and masterfully rolled up the hit team's cell phone network, from the hit team's phones, to their organizers, to a command center at a Hezbollah-run hospital. Most damning was the linkage of the hot phones to none other than Colonel Wissam al-Hassan, the head of Lebanese intelligence who had been tasked with Hariri's security. Though Hassan should've died in the blast, he claimed he had had a university exam that morning, an alibi that fell apart almost immediately. (Think Vito Corleone's driver Paulie, calling out sick the day the Don gets five in the back at the fruit stand.) It spooked Hezbollah enough to warn the young investigator off, as well as maim Eid's boss with a car bomb. Eid went to the UN investigators anyway and was repaid with a Hariri-style car bomb days later. Wikileaks has since revealed the depths to which Syria wanted his investigation stopped, a resolve that has not weakened even as indictments near. There's a lot more to say about the murder plot from the Lebanese angle, but it is also urgently relevant for Israelis. Alarmism has focused on the prospect of Hezbollah engaging in some sort of coup in Beirut. Should they go that far — they have, in the past, crushed Saad Hariri's militia and taken over Beirut when they felt their hand was forced — it would probably be unacceptable to Israel. Neither side wants a war in the imminent future, yet each side believes war is one day imminent. (As do I.) There will be a Hezbollah-Israel rematch, possibly even in 2011. Will UN indictments be the starting pistol's shot? ENDGAME: Despite great pressure from Saudi Arabia and Syria for things to remain peaceful, Hezbollah's behavior is ultimately unpredictable, especially if they feel trapped. 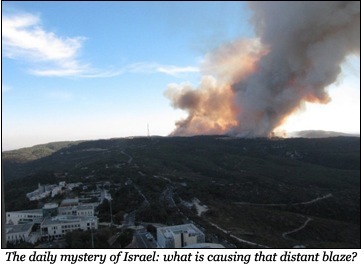 Eventual Israel-Lebanon war is a certainty and will be more destructive than in 2006, in both countries. Tel Aviv will be hit, and Hezbollah will have another surprise in store that no one predicts, as when they nearly sank an Israeli Navy corvette in 2006. Lebanon will be brutally punished, owing to the Dahiya Doctrine. If you are so inclined to look for proof of Bibi's assertion that we are "less divided than ever," gather twenty-six shekels and take the bus trip to Jerusalem. You will exit with one of those "Chemical X" toxic Joker smiles from the Keaton/Nicholson Batman, the gall of the statement and gulf with reality having overloaded and fried your system. An experiment: stand outside the Central Bus Station and find a cabbie willing to take you to Sheikh Jarrah, a mere stone's throw from the Old City. Never mind that they're both considered part of East Jerusalem; I've yet to find a Jewish Israeli cabbie willing to go into the Arab neighborhood. Or even more fun, forego cabs altogether and take the No. 1 bus; I can’t recall a time I took it where I wasn't the only goy amidst the black and white of ultraorthodox Jews. I remember once standing up to let a kindly Haredi couple sit down, and smiling when the woman said "thank you" with the same New Yawk accent I had growing up. I guess that was a more liberal line; many of the public buses, and the long-awaited light rail line, are segregated by gender among ultraorthodox men and women — not to mention the de facto segregation with Arabs. Ultraorthodox youth throw stones at my cab on Friday night; Arab youths mistake me for a settler and drag me out of their neighborhood. Having never visited Cold War-era Berlin or Belfast circa 1972, or even pre-1967 Al Quds, I can't speak directly to how Jerusalem these days compares in the pantheon of divided cities. But if a two-state solution depends upon Palestinian sovereignty in some form over East Jerusalem, and particularly the Haram al-Sharif/Al-Aqsa compound, the ring of settlements in the "Holy Basin" around the Old City have already rendered this impossible. And what a surprise, it is those same "Holy Basin" neighborhoods — Silwan, Sheikh Jarrah, Ras al-Amud, Issawiya — that are the continual flashpoint for Arab-Israeli clashes (whoops), as well as the source of a burgeoning protest movement. Consistently crude attempts to stifle anti-settlement reaction and marginalize Arab claims over the city are both offensive and stupid. Settler organizations' use of dubious pre-1948 claims over Arab property to evict Palestinians is a stupefyingly short-sighted tactic. While settlers have employed that legal argument effectively in their campaign to Judaize East Jerusalem, it sets a precedent for another group to claim pre-1948 ownership over city property. That group, of course, is Palestinian refugees. ENDGAME: East Jerusalem as Palestinian capital made physically impossible by settlements. Continually aggrieved Arab residents likely to grow increasingly radical as non-violent means of organization and activism are proscribed. Continual violence at points of settlement. The Second Intifada began here; the Third is oft-predicted but seemingly inevitable, and Jerusalem will be a theatre. The legitimization of a really horrendous racist fringe has been long time coming. From Kahanist nightclub bouncer to Foreign Minister, Avigdor Lieberman: you've come a long way, baby! Anytime you hear a real pro-Israel advocate employ the liberal-squelching argument that Israel is the only country in the Middle East that nurtures gay rights (which is true — to a degree), look to Interior Minister Eli Yishai, who's capable of hanging with even the most bellicose mullahs. In a country where citizenship is increasingly defined not by liberal values, but by ethnic exclusivity, it doesn't take an Iranian nuclear physicist to realize that blaming the minority is a dangerous wedge to force. 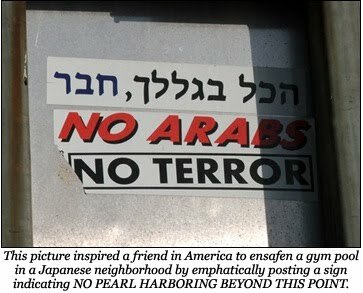 Israeli youth show increasing signs of intolerance towards Arab Israeli citizens, as do prominent right-wing pols. In addition, the ultraorthodox community in Israel remains impoverished and ill-educated, ensconced in government-funded religious schools that do not even teach the basics of liberal arts and science. Shas, the main religious party, expends all of its energy leveraging financial concessions from the government for the religious community. Knesset Member Chaim Amsellem, who had the temerity to suggest the ultraorthodox should be better educated and integrated, is in the process of being expelled from Shas for his revolutionary zeal. ENDGAME: If Gaza and the West Bank are included, there are now more Arabs between the Jordan and the sea. The continued disenfranchisment of Arab Israelis can only cause more radicalization; the population boom of ultraorthodox Jews likewise threatens Israel's economic reputation as a start-up power full of tech-savvy citizens. I really thought he might be different. And apparently Netanyahu did too; he was genuinely spooked at the beginning. And then Obama reliably began to lose his nerve. He blew the two years he'd be most powerful, with the most leverage over Netanyahu. Obama's focus on the settlement freeze was the right one; his mistake was in not staying resolute and threatening Israel's military aid package. Obama didn't want to pick a fight with the lobby, which means he never will. ENDGAME: Obama blew the biggest chance to restart the process since Camp David.